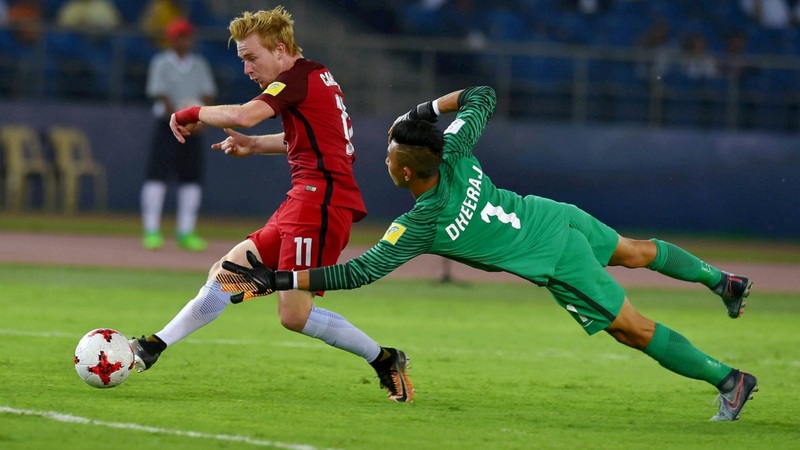 The whole country is hailing the performances put on display by the Boys in Blue, particularly against Columbia where they came microscopically close to getting their first ever FIFA point, besides making a mark by scoring through Jeakson Singh Thounaojam header. Many journalists and experts however are more critical than others, raising questions on the discipline with which some of the players took the pitch. However, one name which no critic is refusing to hail is the true find of Indian football— Dheeraj Moirangthem. 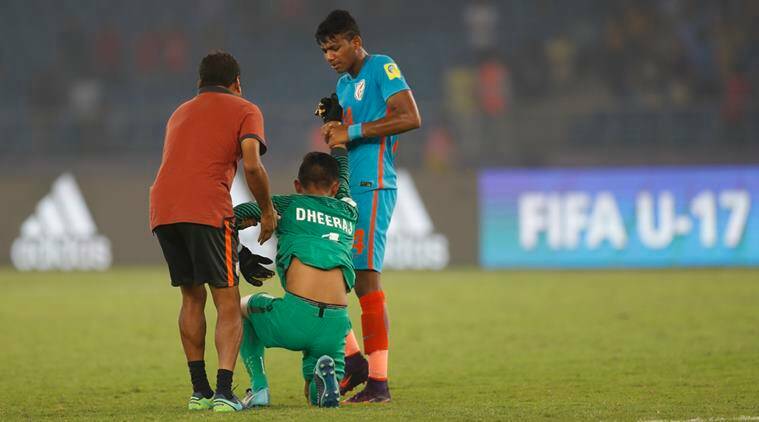 Dheeraj, the hero of a Billion cheers was the last line of defence and surprisingly for a 17-year old boy joining a global rampart, his brilliant saves and emotional conduct has throbbed thousands of hearts, making him a household name in the country. Many news outlets are even claiming the interests shown by the International clubs in the prodigy. However, we think its too early to judge anything and so we decided to learn about the whole buff from someone who knows the best. Well, this implies a thousand words about how we didn’t perform rather than we did, but he rather focussed on not to pointing out the odds. Gurpreet insists that this World Cup in India wasn’t for us to really claim it. “This was the World Cup for people who knows football, to look at how much difference there is between the best and us”, he says. "People who had false hopes of India doing a Spain or Germany should know that it was rather to reflect on how much work there is to be done, before we were ready to play in a World Cup like competition. The coach and the administration would certainly look at the loopholes that we had and work upon them. If you compare India with other better teams in Asia, take Thailand for instance, we need to improve our game taking lessons from them”. We indeed agree with the man considering the kind of opportunities the U-17 Indian team had in their platter, minus a couple of years since when the AIFF really got into the groove to prepare for the World Cup. Is it what you call preparation? Our team opines this entire hullaballoo was merely a marketing activity to gather as many eyeballs. JERSEY: Gurpreet, we had a rather complex campaign which only resonates the disappointment, despite all the money that’s been put behind. Your word on it? Talking about Dheeraj, Gurpreet himself showered all the praises insisting that he’s glad seeing the quality of footballers coming up. and that one day he’d be glad that a world class goalkeeper succeeds him before the posts. “Though these boys have to learn a lot before hitting the actual star but the first step has been taken in the right direction” he said admiringly. “Dheeraj is only 17 and there are many things which will change in his game. I hope he works upon all his blotches and that he gets good coach and even better exposure. On the telly, I saw how mindful he was on the pitch, if I compare him to myself at that age. The level of maturity and exposure in the games was commendable. Imagine, these boys have played almost 45-50 games at the age of 17 for the national team. Can you guess the level of experience you get with that number? We would play five competitive games, or a bit more if we were lucky in a year”, Gurpreet added. The thought of hosting a football world cup in India itself is moving and so this entire media buff is justifiable, but Gurpreet has left us all with a prominent questions as to what is going to happen once its all over? JERSEY: Considering AIFF’s past record in terms of developing the youth system and how ISL is developing itself as, do you see any bright future for these players up ahead? GSS: It’s very hard to say. It’ll be their choice entirely to pick the best for them. They need to constantly improve their game so that they find a club, and most importantly a first team. The players also need to fix international opportunities on their own if they’re willing to go abroad to play. I did it for myself, no one ever helped me. The Federation is not going to help either, so if they’re willing to play outside India, they must be proactive and working hard towards it to shine their football careers. “I’ve seen Dheeraj play before, in Norway when he played against my club, Stabæk. He was a good raw talent and like everyone else, I was in his awe myself. One thing I want to point out is that if he performed anything below this, I think I’d be greatly disappointed in him”, said the Bengaluru FC’s star goalie.